Another NHL season concluded, and another dissappointing post season has been produced by Alexander Ovechkin and the Washington Capitals. 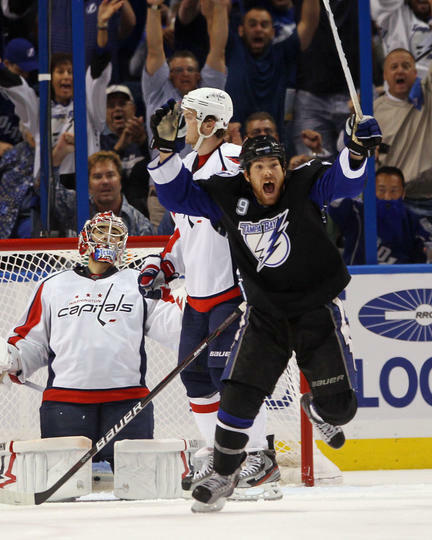 The Washington Capitals saw their season and chances at hoisting the Stanley Cup come to an end as they were swept 4-0 in a series against the Tampa Bay Lightning in the Eastern Confrence Semifinals. It has come to be a little routine talking about dissapointing post season performances by the Capitals being they have been eliminated before the finals in every season since the '07-'08 season. They came into this seasons playoffs the East's top seed and supposedly commited to more of a defensive style game, nobody told the Lightning that, who scored 16 goals in the four games they played. The star power did not show up for the Capitals in the seocnd round, except that of Alexander Ovechkin who ammassed 10 points (5-5) four of those in the second round. Alexander Semin and Brooks Laich both acquired 7 to round out the top three point getters on the team. Mmmm where was Nicklas Backstrom he only recieved two points through out the entire playoffs bothing coming on assists, he did know they were in the playoffs right? Adding to the problems of not scoring the Capitals could not stop the Lightning's star players from making a difference. Lighting Captain Vincent Lecavalier gained six point (3-3), Martin St. Louis adding five points (2-3), and Steve Downie with five points (1-4) through the four game series. Along with the stars coming through the Capitals could not stop the Lightning's role players, especially Sean Bergenhiem who found the back of the net four times through out the series, and seemed to be kryptonite to the Capitals, scoring many key goals in the series. Given the continued failure by the Capitals expect to see some big changes during the offseason, trying to shake things up and find a winning combination. 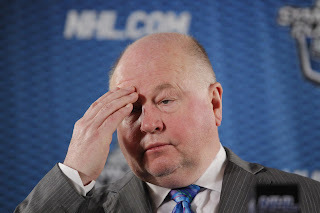 A Bruce Boudreau firing may not be in the cards as Capitals General Manager George McPhee said he expects Boudreau back as the head coach next season. Watch the Capitals closely during the offseason. It's these types of hublot replica sale as well as apparently minor technicalities that comprise a genuine collector's item, as well as eventually ask them to clamoring as well as looking for the actual items. Generally, many of these fake rolex sale happen to be fussed along with or even keep the fake Rolex watches of your time, however replica watches uk one which noticed royally mild make use of is really a actual deal with for that fanatic. The replica watches sale have now stopped working. The hands have gone floppy and just spin round when you move your wrists. I would like a full refund for both replica watches. These replica watches were a gift from my wife for my birthday. I am very disappointed with the quality and would have expected these top class rolex replica to last years not a couple of months. Please can you let me know.